The glabellar is the area of the forehead in between the eyebrows. Often, as we speak and express ourselves we tend to use and overuse the muscles in the area. Contraction of these muscles results in a frown, the angry look. In most people these lines form two vertical wrinkles in between the eyebrows, often referred to as 'the number 11'. In some people, these lines can be horizontal. These lines can either be dynamic or static and most people find that friends and family tend to comment that they look angry or appear to be in a bad mood when in fact they're perfectly happy. This area can be treated with the use of Botulinum toxin A in a simple, straightforward and relatively painless manner. In fact, it is the commonest area treated in this manner. Sometimes, when the lines in this area are static (present when not contracting the muscles underneath) or if they are very deep, dermal fillers can be used to fill out the wrinkle. Aesthetic Virtue is a London-based clinic offering Botox injections for the treatment of glabellar lines and other common facial wrinkles and imperfections. The Harley Street london Clinic has state-of-the-art facilities and enables patients to enjoy a comfortable and welcoming environment throughout their treatment. Our doctors are all fully accredited, advanced practitioners with years of experience in using Botox injections to provide stunning results. At Aesthetic Virtue in London, we are completely focused on you as an individual and will always strive to give you a natural-looking end result that exceeds your expectations and makes you feel confident about your appearance. Aesthetic Virtue in London offers Botox injections for the treatment of glabellar lines. Botox is usually the best solution for these lines because it works by weakening or paralyzing the muscles so that the lines soften and ideally disappear. The preferred treatment of glabellar lines is Botox injections although Dermal fillers can also be used. Botox injections offer a safe, approved and non-surgical solution to many of the wrinkles and facial changes commonly associated with ageing, including glabellar lines. Botox is a temporary solution and its effects are fully reversible. Although its full benefit may not be seen for a couple of weeks after a treatment, the effects of Botox typically last for about three to four months. Botox injections are quick and convenient to administer and Aesthetic Virtue in London offers some of the most competitive Botox prices in London. Botulinum Toxin is a purified protein and the injections are an extremely safe procedure. These injections use a fine needle and a small dose of Botox, which is injected into a targeted area of muscle or muscle groups to cause temporary muscle relaxation. The actual procedure will take just five to ten minutes and involves a small number of injections. Botox is a brand name for Botulinum Toxin Type A, a purified natural protein chemically derived from bacteria that can be injected into a muscle to cause temporary muscular relaxation. It can be used to treat the appearance of frown lines, worry lines and laughter lines, for example, all of which are caused by the repeated contractions of the facial muscles. Botox typically reduces the appearance of wrinkles by about 80%, leading to a more youthful, fresh appearance. Botulinum Toxin Type A has been used for cosmetic purposes in thetreatment of wrinkles since the 1990s and is currently the most popular treatment available. In fact, Botox injections in the UK are becoming increasingly popular because they offer a non-surgical, less invasive and cheaper alternative to cosmetic surgery. The treatment is convenient to administer, widely tolerated by the majority of patients and offers a high level of customer satisfaction. Is it a safe drug? Like all other prescription medicines, if used with precision and accuracy by specially trained and experienced individuals, Botulinum Toxin is a very safe drug, with minimal side-effects and complications. Botox works by binding to the junction between the nerve and the muscle locally (at the precise point where it is injected) to stop the signal being transmitted, therefore preventing the contraction of those individual muscle fibres. This effect is reversible; in time, these junctions recover their normal function and the toxin is broken down by the body and removed. No, Botox takes between three and 14 days to take full effect. This varies significantly between individuals. On average, it lasts approximately four months. How often can I have my Botox treatments repeated? It is wise to wait until the previous dose has worn off before receiving another treatment. 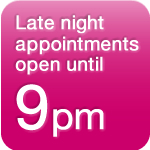 We generally advise a minimum of three months between repeat treatments. I want a natural look, and am scared of looking expressionless and frozen. How can this be achieved? 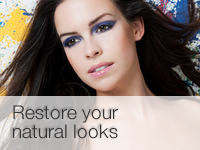 At Aesthetic Virtue, we always strive to obtain the natural look. With Botox, a standard dose to the individual muscles is administered. After two weeks, we offer a complimentary follow-up and free top-up for most Botox treatments. This is to ensure that patients are not over-treated and the risk of side effects is minimised. 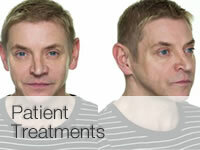 An integral part of the treatment is the consultation. Together with your doctor, you will discuss the problem areas, the possible treatments and any concerns will be addressed. We will then require you to sign a consent form and to take pre-treatment photos. The doctor will then apply numbing cream to the area. At this stage, she will mark the sites to be injected and, after cleaning the area, the treatment will be administered in the form of fine injections using very fine needles. Anti-bruising cream is then applied to the treated area(s). I am needle-phobic, how painful is the procedure? We understand that many of our patients may be apprehensive about being on the receiving end of a needle, so while we reassure you that this is a relatively painless procedure with minimal side-effects, we do apply numbing cream to the area to be treated beforehand. It is common to have small raised bumps of skin at the injection site; these may be slightly red and will go down about 20 minutes after the treatment (please feel free to wait in our waiting room enjoying a cup of tea until these go down!). Bruising at the injection site may occasionally occur; this will resolve quickly. It is quite common to experience a mild headache after Botox injection to the face. This can be easily treated with over-the-counter painkillers. Are there any long-term complications? As the effects of Botox are not permanent, most complications will last as long as it takes for the effects of the Botox to wear off. What are the long-term complications? These are very rare and depend on the site involved. Complications can include migration of the product to surrounding muscles causing weakness in areas where muscle movement is still required. Your doctor will talk you through the side-effects and potential complications and address any concerns you might have prior to administering the treatment. I've heard so many horror stories. Which are true? Please discuss any concerns with your doctor. Who cannot or shouldn't receive Botox? Pregnant and breastfeeding women; people taking anti-coagulant medication, including herbal medicines (please do not stop any medication before discussing it with your GP or with the specialist prescribing that medicine); infection at the injection site; people with allergies to egg albumin or known allergies to Botulinum Toxin; people who have suffered previous severe adverse reaction to the toxin and concomitant treatment with some aminoglycosides. Will my wrinkles rebound when the Botox wears off? The wrinkles will return to the state they were in before. They won’t be any worse. What should I do or not do following the treatment? For the next four to six hours, do not rub or massage the area, avoid strenuous exercise, avoid hot baths, showers or saunas, do not lie flat and avoid alcohol. All my questions were addressed, treatment options, outcomes, potential side effects and after-care instructions were very clear. And the procedure was far less painful than I had imagined! A gentle hand… you might have very possibly cured my needle-phobia finally! And thank goodness, as everybody thinks I’m looking younger and fresher now! A clinic that insists on natural results! Fabulous! Now I’m loving the compliments. Dr Raina has been my doctor for the last 18 months, and she will be for many months longer. Recently my 20 year old daughter (who has beautiful full lips) told me she wanted to get her lips enlarged and that she had already spoken to another doctor about it, who was willing to do it for her. I took her along with me to discuss it with Dr Raina who explained to her that her natural lips are very nice and in proportion with the rest of her face. She mentioned that more volume will ruin the proportions and she would look ‘done’. We are both very grateful for the honesty there. A very professional, honest and straightforward doctor with surgical skills to match! My right earlobe split 6 years ago, and I was too anxious to have it repaired. Now, I have no idea why I didn’t get it done sooner! After discussing the pros and cons of removing the mole on my face, I finally underwent the procedure. Three months on, I am very pleased with the result. I appreciate the no frills honesty and straightforwardness. Highly professional… I will certainly be recommending you!